Super Heavy Duty Trolley with increased load capacity and front steering 'trailer' for ease of use. Frame is manufactured from heavy duty 50mm x 50mm steel and is polyester powder coated white. Hinged handle and axle steering for carrying greater weight. Front steering 'trailer' action for ease of manoeuvre. Maximum loading capacity 750kg. Suitable for 2m x 1m, 1.8m x 1.22m and 1.22m x 0.9m rigid mats. Q: How many mats can you put on the Super Heavy Duty trolley (MAT-012)? 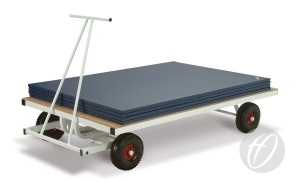 A: The maximum number of 25.4mm mats that can be safely placed and transported on the trolley is 45. Q: What is the maximum tyre pressure on the Super Heavy Duty Trolley? A: 50 P.S.I. but would recommend not exceeding 40 P.S.I.